What is Transmission Fluid? How Often Should VW Transmission Fluid Service be Changed? ATF is also used in some power assisted steering systems as a hydraulic fluid. Some newer front-wheel drive manual transmission vehicles use ATF as well. Finally, ATF is used as a crank case lubricant in 4WD vehicles. Routine monitoring and replacement of transmission fluid is essential to maintaining your car. If you are not comfortable doing this yourself, the experts at Snohomish VW Transmission Fluid Service can schedule the change for you. ATF fluid is dyed to make is discernible from oils and other hydraulic fluids. Before changing your car’s ATF, it is essential that you only use ATF per manufacturer recommendation. Often the manufacturer will require “genuine” or Original Equipment Manufacturer (OEM). Using the wrong ATF can result in catastrophic transmission damage. Your car’s engine must be warm to check the ATF level. Either check the ATF immediately after driving, or allow the engine to run until warm. Leave the engine running, and lift the hood. Locate the ATF dipstick – located at the back of the engine; remove the dipstick and wipe clean with a rag or paper towel. Replace the dipstick, being certain to fully insert, remove the dipstick and read the level. You will notice two markings; one for “warm” reading, and one for “cold” reading. Be sure to read the appropriate level. If the level is low, add ATF through the dipstick hole (use a long-necked funnel). Be certain to add small quantities at a time so as not to overfill. Replace the dipstick once the level is correct. Nowhere near as simple as checking ATF, to check manual transmission fluid, you must raise your car to access the transmission. It is essential that the car be level before checking the fluid level. Being absolutely certain to remove the correct plug (“Fill Plug”), insert a screwdriver into the fill port. The blade of the screwdriver should remain level with the bottom of the fill hole. When you remove the screwdriver, if there is fluid on the blade, there is sufficient fluid in the transmission. If, on the other hand, the screwdriver blade is dry, the fluid level is low. It is strongly advised that you allow the experts at Snohomish VW Transmission Fluid Service perform a fluid level check every 10,000 miles. Generally, manual transmissions need a full transmission fluid replacement every 30,000 – 60,000 miles. What Happens to Transmission Fluid? Automatic transmissions run extremely hot and the ATF degrades over time. 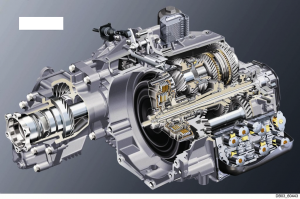 Also, over time, the internal components of the transmission will begin to wear and leave particulates in the fluid. Manual transmission fluid does not degrade like ATF, but the transmission does wear and leave particulates in the fluid. The particulates in either transmission fluid will decrease the lubrication provided and can cause damage to the components, decreasing the life of your car’s transmission.